On Saturday 21st November Neyland man, Henry Durrant, presented a cheque for £10,600 to Prostate Cymru at its annual dinner at The Towers Hotel, Port Talbot on behalf of ‘Pembrokeshire Friends of Prostate Cymru’. 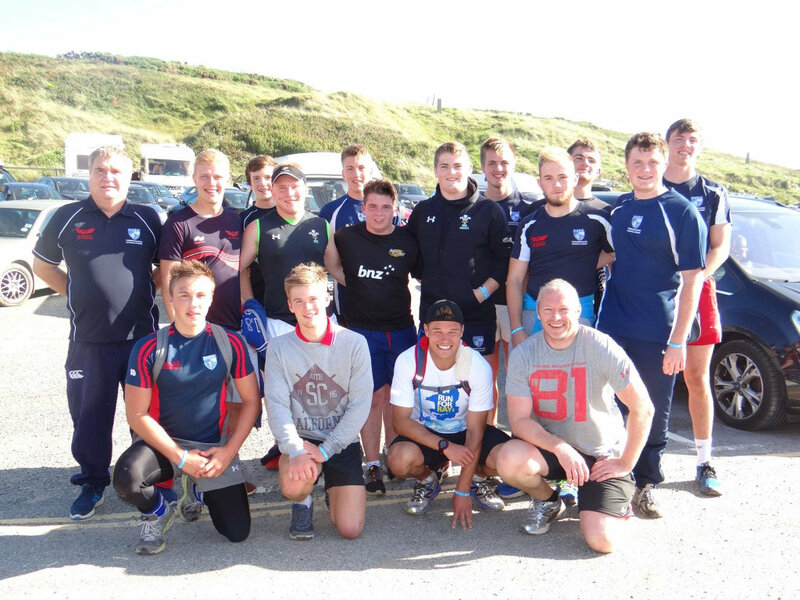 During the last week of August Henry undertook the task of running the Pembrokeshire Coastal Path which reflected a distance in excess of a marathon a day. The choice of Prostate Cymru as the designated charity was an easy one for Henry. When his girlfriend’s grandfather passed away 12 months ago, Henry pledged to undertake a fund-raising project in his memory. Ray Williams O.B.E. was a stalwart in the context of Welsh Rugby. A coaching guru, he was recognised internationally for his innovative method and technique. He then became an administrator for the WRU. Just months before his passing he became the first Welshman to receive the Vernon Pugh Award for services to rugby. But Ray also had a passion in local charity work and he became a founder member of ‘Friends of Pembrokeshire Prostate Cymru’. There were months of preparation prior to the event – including an arduous training regime and the support preparation by the local committee. The week itself was a bit of a ‘mix and match’ in terms of weather conditions with some horrible rain and wind during the first two days. His partner, Katy Griffiths – a Sports Pysiotherapist -lent daily support in terms of massage and regular taping of toes. Additionally all the Pembrokeshire committee members turned out for moral support and manning collection buckets. 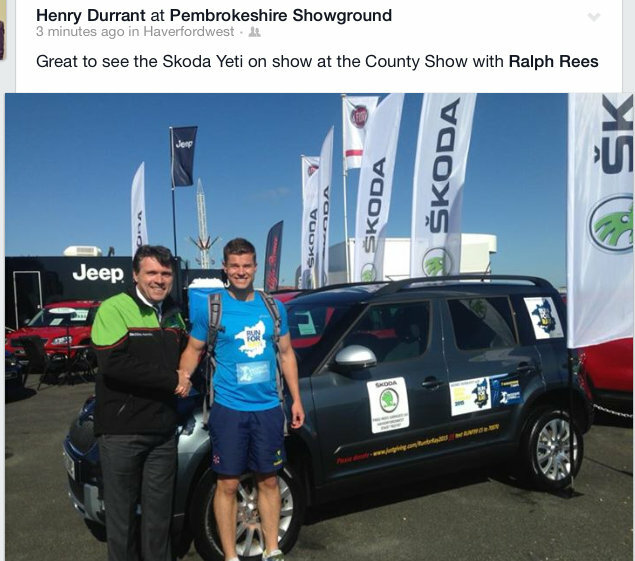 Special thanks to Judith Griffiths – Ray’s daughter – for much of the pre-planning, and to Ralph Rees, Managing Director of Fred Rees Garage, for providing the new Skoda Yeti as the ‘support vehicle’ for the week. The committee would wish to express special thanks to the ‘7 Day Sponsors’ – Dickie Parry, Snowdrop Independent Living, Milford Haven Port Authority, Dunraven Windows, Sue Pile, PRAg, G. D. Harries – and to FBM and the Farmer’s Arms, St. David’s who sponsored an event mid-way through the week, “An Evening with Graham Price”. The former member of the Pontypool and Wales front row reflected on his playing career and thoroughly entertained a ‘full house’ with his anecdotes on his club and national playing days, together with his fond memories of Ray Williams. He was welcomed and introduced by Geoff Williams, Head of BBC Wales Sport. Henry would wish to thank all those individuals who generously contributed to his target by donating on-line at ‘Run for Ray – Just Giving’. A special thanks to Wendy Bradshaw (St. Ishmaels C.C. 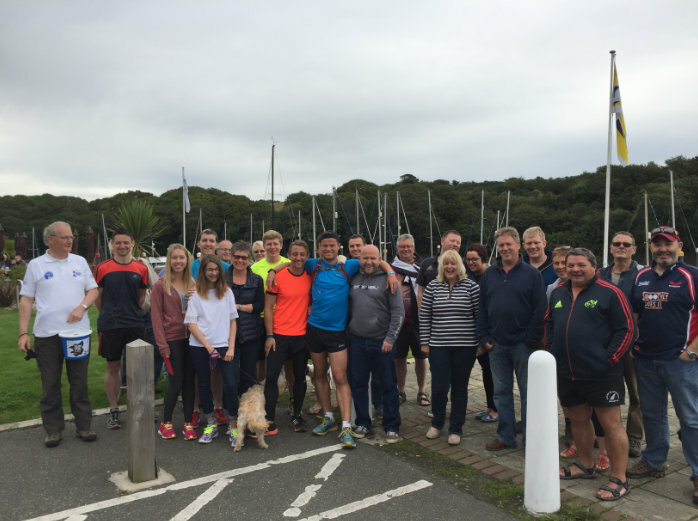 ), Delyth Summons (Haverforwest RFC and Johnston CC) and Andrew Davies (Neyland AFC) for their hard work in raising substantial amounts. Asked about the ‘highlight’ of the week, Henry said “everyday brought a new experience with stunning scenery. I met some really nice people en route and made some new pals through the ‘Friends Committee’. I guess if I’m really honest the ‘best bit’ was crossing the finishing line on Sunday (in the rain!) at Little Haven – mission accomplished!! 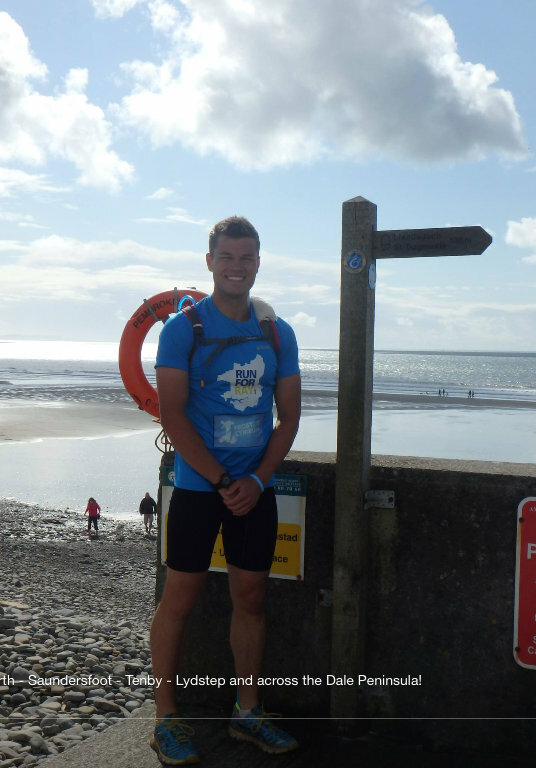 Would like to thank everyone involved and those who supported me by joining in sections of the 186 miles, especially Tom Jackson who ran the first day with me, and Leigh Schvartz, a former house-mate from London, who ran the last two days”.